My husband and I were away for the weekend attending his cousin's wedding. We spent the weekend in this delightfully lavish hotel that was very modern chic. Nearby was a quaint little chain restaurant called "The Village Inn." With similar breakfast choices to Perkins but a higher food quality, we decided to go there for breakfast both mornings we were in town. Glad we did! Peel, rinse, and slice the potatoes. Put them in a medium pot with water until potatoes are fully covered. Bring water to a boil and reduce heat so that it doesn't boil over. Boil until potatoes are tender (about 8-10 minutes, depending on the size of the potato slices). Meanwhile, dice the onion and put it in a medium frying pan. Add olive oil, steak seasoning, garlic, and pepper to the onions. Cook until onions are browned and tender. 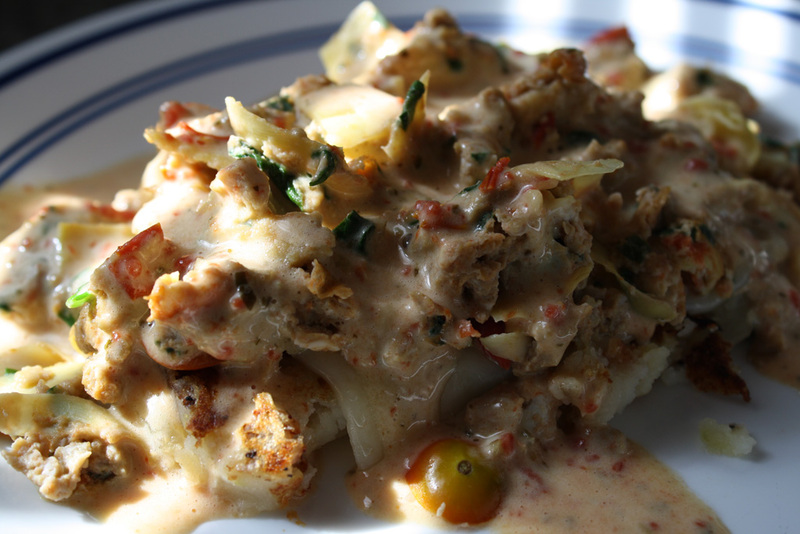 Then, dice the tomatoes, artichoke hearts, and spinach. Scramble the eggs in a bowl using a fork or whisk. When the potatoes are done boiling, pour the water into the sink. Add the 1 tbsp of margarine and 2 tbsp of milk. Mash with a potato masher until well-combined and all lumps are gone. Mix in the onions. Spray a griddle with butter-flavored cooking spray. 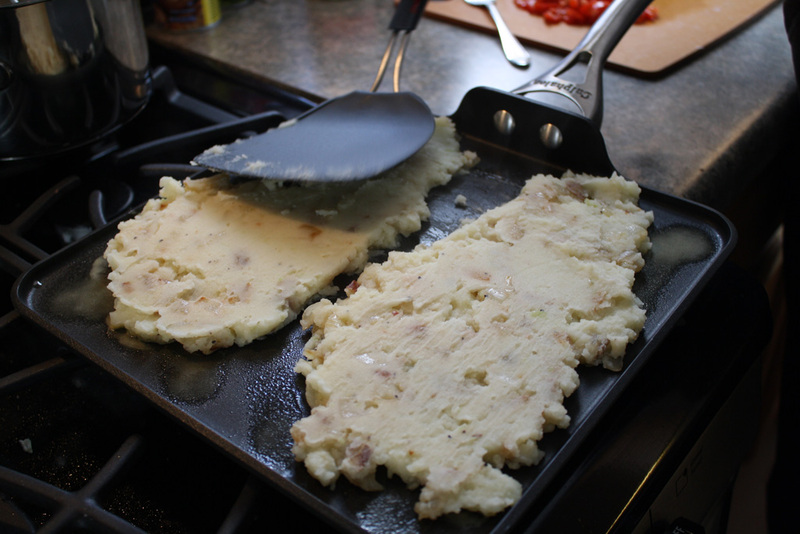 Then spread the mashed potatoes evenly across the griddle. Cook at medium-high heat for about 5 minutes on each side, or until golden brown. When they are done, place them on a plate as they are the first layer of our awesome breakfast treat! 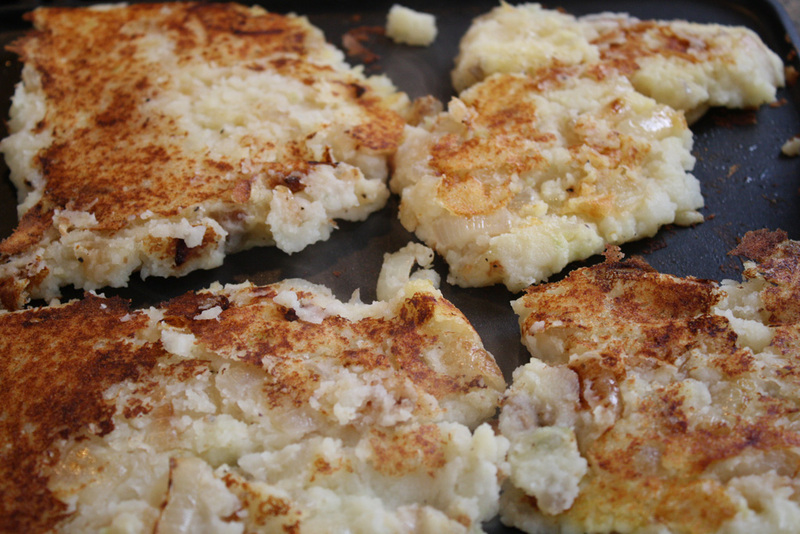 While the potato pancakes are cooking, heat up 1 tbsp of butter light (or magarine) in the pan you cooked the onions. 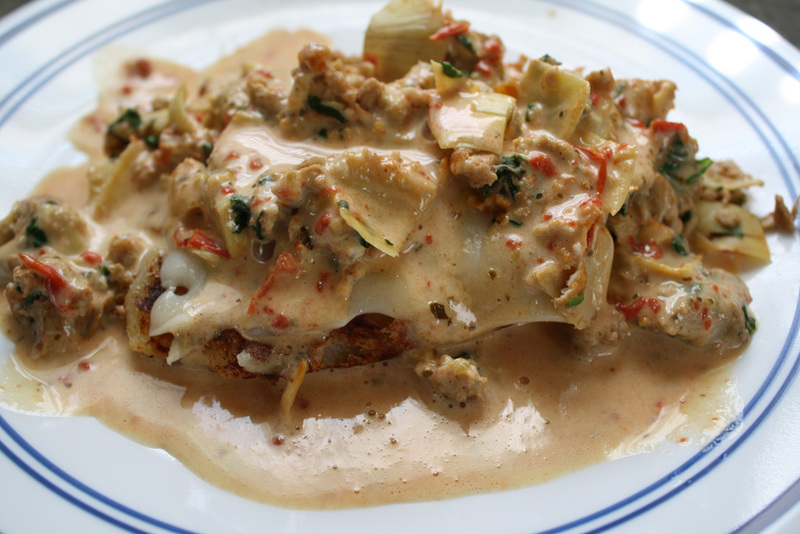 Add the spinach, tomatoes, and artichoke hearts. Cook for 1-2 minutes. 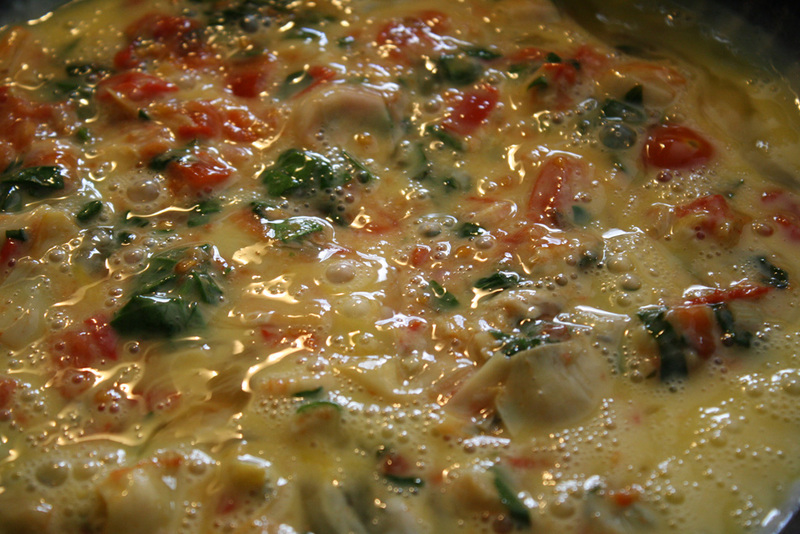 Then pour the scrambled egg mixture over the top and stir until the eggs are fully cooked. Put a slice of Swiss cheese on top of the potato pancakes. Then divide the scrambled eggs and pour on top of the Swiss cheese potato pancakes. Cut the 1/2 cup of butter up into tbsp size pieces and place in a microwave safe container. Microwave on medium heat (about 4 or 5 power) for 1-2 minutes or until completely melted. 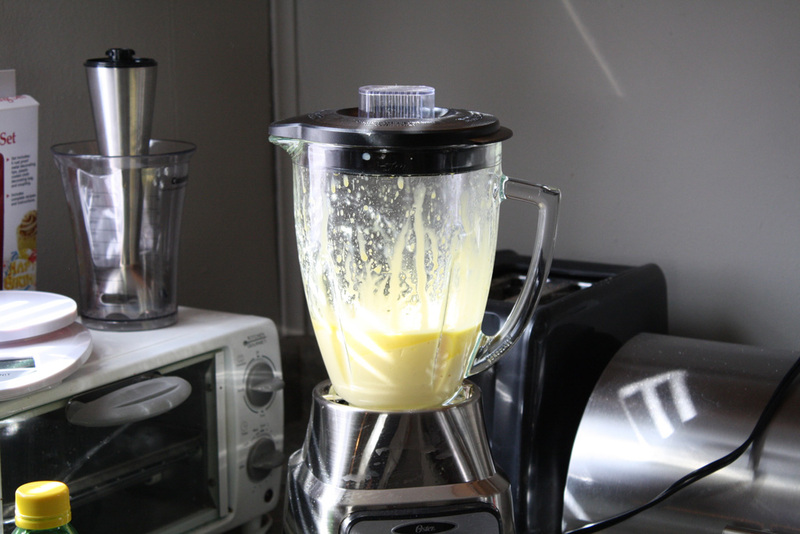 Meanwhile, in a blender, combine the egg yolks, lemon juice, and dijon mustard. When the butter is melted, carefully remove the piece that sits inside the lid (or lift the lid to your blender partly up) and pour the melted butter in while the blender is on. If your lid is completely off, the butter will splatter everywhere! 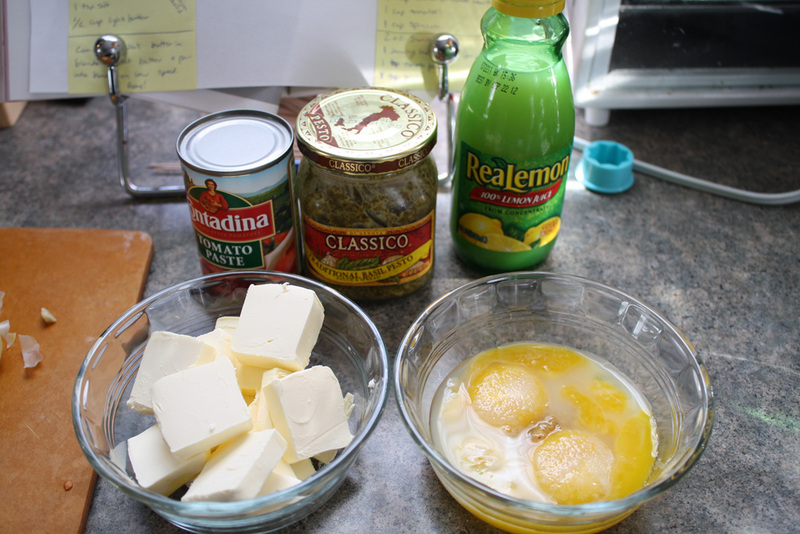 When the butter has fully combined with the mixture and thickened, add the tomato paste and pesto. 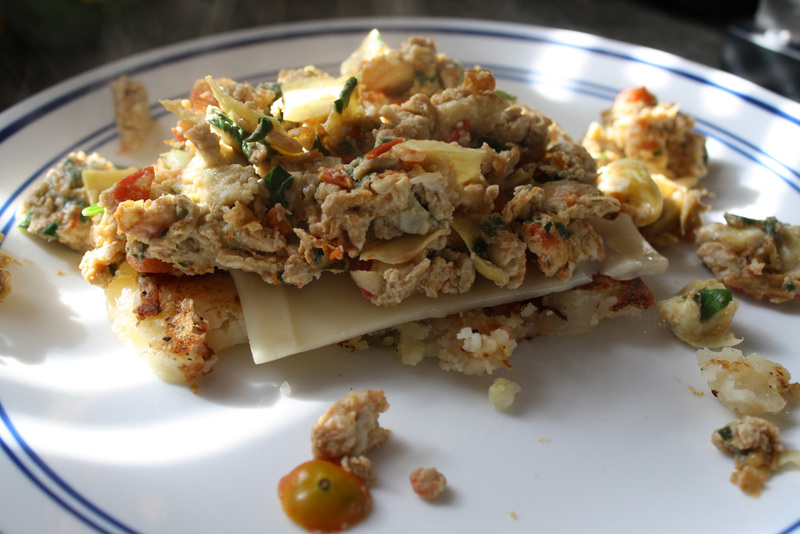 For the finishing touch, pour about 1/4 cup of tomato basil Hollandaise sauce on each scrambled egg dish.